This song is referenced by and is based on the music of Song 124 – Oh Well! and is referenced by Song 021 – Dunes. I had a duplicate file referencing Numbers 21:17, and did not realize Song 124 had already been written. 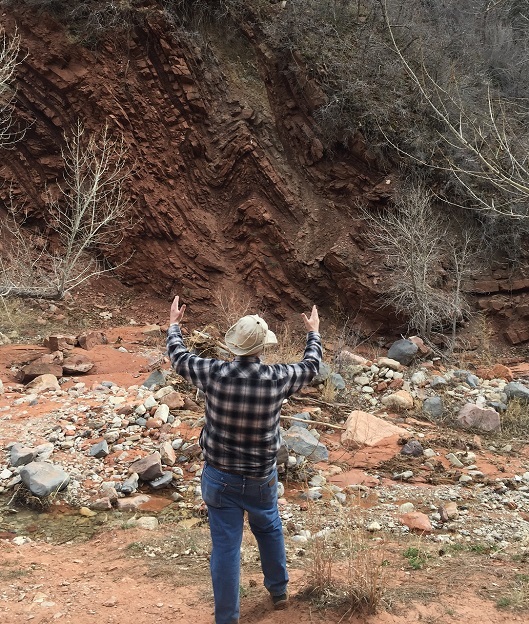 So, on the 13th of April of 2018 I pulled out the Glossary of Geology by Bates and Jackson and looked up the definition of a thrust fault. I then used the tune which was written back in November of 2006, added a third line to the chorus: “As cuttings repeat when pulled from the well.” With overthrust faults, the same layers can be repeated several times. This line is intended to catch the fact the layer broke and was pushed on top of itself at least 1 time, to create an overthrust or a repeating layer in the subsurface. In order for this to be recognized, Verse 1 points out “the well bore must have passed through an unexpected fault with a dip less than forty-five degrees, where the hanging wall moved upward relative to the footwall.” Verse 2 teaches “This means there has been horizontal compression, Where we expected simple vertical displacement, Making this prospect much more complicated, Than we thought when we made the initial maps.” From a regional perspective, Verse 3 teaches “During the formation of the mountains, The faults are somewhat arcuate, Generally linear and orthogonal to, The direction of plat tectonic compression.” These over-thrusted layers only occur within what Verse 4 defines as an orogenic (mountain building) belt, “With displacement towards the interior, Contrary to the general direction Of tectonic transport.” I realize this is a funny thing to write a “song” about. Going back to the origin of these thoughts, I can still see in my mind dancers with different colored outfits, where each color represents a layer of earth. One layer, say the blue outfits, can be shown by dancers lying next to each other on the stage. The next layer, say the red outfits, can be shown by dancers standing in back of the blue dancers. Then as there is compression from the edges of the stage, there is a buildup in the center of the stage, until it breaks, and the blue and the red are made to look like they are moving across and on top of the blue and the red that is being overthrust. The original idea was to use dance to teach basic geological principles, just as dance was used to describe the activity in a honey bee nest when I got the idea. 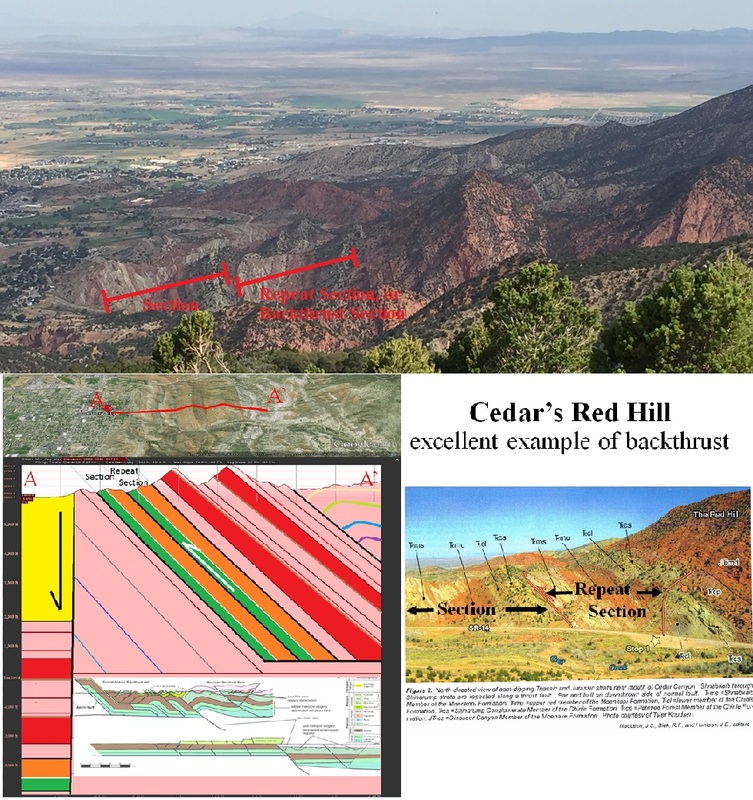 Following the dance, the audience could be taken up Cedar Canyon, to see the layers right under the Red Hill Navajo Formation so see a beautiful and world class example of a back thrust, which is a variation of a thrust.